Unless you have a vehicle that stores a tire on the exterior, most people tend to forget about the spare. It lives under our trunks and we don't give it a second thought until we need it in a tire crisis, let alone think about how to change a tire. Whether you get a flat or experience a blowout, the spare is there to help you get back on the road in a matter of minutes. But what if you went into the trunk and found no spare tire in your new car? Nearly every car used to come with a full-size spare tire. In recent times, however, fuel economy requirements, trunk space allotment, and safety concerns have prompted automakers to shift toward smaller temporary spares. In some vehicles, there's no spare at all. Whether you change your flat tire or not, it is good to learn about the different types of spares before purchasing a new car. That way, you know what kind of spare you have if a tire emergency occurs and you won't be caught off-guard when you go looking for a spare that might not be in your trunk. A full-size spare is the same exact size as the other tires on the vehicle. Full-size spares come in either matching or non-matching varieties. A matching spare is completely identical to the other tires currently on your car. A non-matching spare will typically have a lighter-weight construction and a shallower tread depth that reduces vehicle weight to improve fuel economy. It is becoming more and more rare for passenger cars to have full-size spares. Trucks or larger SUVs are much more likely to offer the full-size spare option. Automakers have shifted to temporary spare tires or "donuts" because they offer the best balance between size and usability. 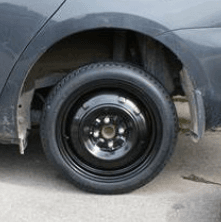 Temporary spares are smaller than the vehicle's other tires, take up less trunk space, and are light enough for most people to handle when they're changing a flat. But since they are not quite equal to your regular tires, they are only meant to be driven a short distance, at speeds no faster than 55 mph. 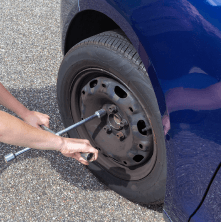 If you ever find yourself with a flat and you don't have a spare, call 1-800-Pep-Boys (737-2697) and our call center will dispatch a premier towing service to your location. Whether it's a flat tire, a flashing dashboard light, or a dead battery, our towing service providers will be alerted to the issue so that when your vehicle is brought in, our professional Pep Boys technicians will be up to speed and ready to help you get back on the road as quickly as possible.